The globe artichoke (Cynara cardunculus var. scolymus), also known as French artichoke and green artichoke in the USA, is a variety of a species of thistle cultivated as a food. 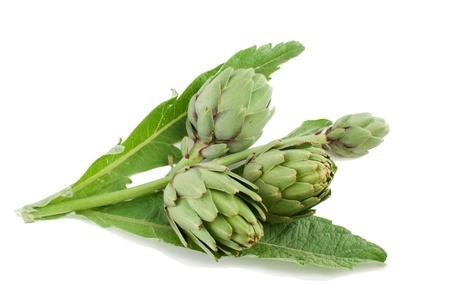 Artichoke contains the bioactive agents apigenin and luteolin. The total antioxidant capacity of artichoke flower heads is one of the highest reported for vegetables. Cynarine is a chemical constituent in Cynara. The majority of the cynarine found in artichoke is located in the pulp of the leaves, though dried leaves and stems of artichoke also contain it. The artichoke is mentioned as a garden plant in the 8th century BC by Homer and Hesiod. The naturally occurring variant of the artichoke, the cardoon (Cynara cardunculus), which is native to the Mediterranean area, also has records of use as a food among the ancient Greeks and Romans. Pliny the Elder mentioned growing of 'carduus' in Carthage and Cordoba. In North Africa, where it is still found in the wild state, the seeds of artichokes, probably cultivated, were found during the excavation of Roman-period Mons Claudianus in Egypt. Varieties of artichokes were cultivated in Sicily beginning in the classical period of the ancient Greeks; the Greeks calling them kaktos. In that period, the Greeks ate the leaves and flower heads, which cultivation had already improved from the wild form. The Romans called the vegetable carduus (hence the name cardoon). Further improvement in the cultivated form appears to have taken place in the medieval period in Muslim Spain and the Maghreb, although the evidence is inferential only. The blossom of the thistle, improved by the Arabs, passed from Naples to Florence in 1466, carried by Filippo Strozzi. Towards 1480 it is noticed in Venice, as a curiosity. But very soon veers towards the northwest...Artichoke beds are mentioned in Avignon by the notaries from 1532 onward; from the principle [sic] towns they spread into the hinterlands ... appearing as carchofas at Cavaillon in 1541, at Chateauneuf du Pape in 1553, at Orange in 1554. The local name remains carchofas, from the Italian carciofo ... They are very small, the size of a hen's egg ... and are still considered a luxury, a vaguely aphrodisiac tidbit that one preserved in sugar syrup. The Dutch introduced artichokes to England, where they grew in Henry VIII's garden at Newhall in 1530. They were taken to the United States in the 19th century—to Louisiana by French immigrants and to California by Spanish immigrants. Today, cultivation of the globe artichoke is concentrated in the countries bordering the Mediterranean basin. The main European producers are Italy, Spain, and France and the main American producers are Argentina, Peru and the United States. In the United States, California provides nearly 100% of the U.S. crop, and about 80% of that is grown in Monterey County; there, Castroville proclaims itself to be "The Artichoke Center of the World", and holds the annual Castroville Artichoke Festival. Most recently, artichokes have been grown in South Africa in a small town called Parys located along the Vaal River. Artichokes can be produced from seeds or from vegetative means such as division, root cuttings, or micropropagation. Although technically perennials that normally produce the edible flower during only the second and subsequent years, certain varieties of artichokes can be grown from seed as annuals, producing a limited harvest at the end of the first growing season, even in regions where the plants are not normally winter-hardy. This means home gardeners in northern regions can attempt to produce a crop without the need to overwinter plants with special treatment or protection. The seed cultivar 'Imperial Star' has been bred to produce in the first year without such measures. An even newer cultivar, 'Northern Star', is said to be able to overwinter in more northerly climates, and readily survives subzero temperatures. Commercial culture is limited to warm areas in USDA hardiness zone 7 and above. It requires good soil, regular watering and feeding, and frost protection in winter. Rooted suckers can be planted each year, so mature specimens can be disposed of after a few years, as each individual plant lives only a few years. The peak season for artichoke harvesting is the spring, but they can continue to be harvested throughout the summer, with another peak period in midautumn. When harvested, they are cut from the plant so as to leave an inch or two of stem. Artichokes possess good keeping qualities, frequently remaining quite fresh for two weeks or longer under average retail conditions. Apart from food use, the globe artichoke is also an attractive plant for its bright floral display, sometimes grown in herbaceous borders for its bold foliage and large, purple flower heads. Large globe artichokes are frequently prepared by removing all but 5–10 mm (0.2–0.4 in) or so of the stem. To remove thorns, which may interfere with eating, around a quarter of each scale can be cut off. To cook, the artichoke is boiled or steamed. A cooked, unseasoned artichoke has a delicate flavour. There are many stuffed artichoke recipes. A common Italian stuffing uses a mixture of bread crumbs, garlic, oregano, parsley, grated cheese, and prosciutto or sausage. A bit of the mixture is then pushed into the spaces at the base of each leaf and into the center before boiling or steaming. A similar recipe is popular in coastal Croatia. In Spain, the tenderer, younger, and smaller artichokes are used. They can be sprinkled with olive oil and left in hot ashes in a barbecue, sautéed in olive oil with garlic, with rice as a paella, or sautéed and combined with eggs in a tortilla (frittata). Artichokes can also be made into a herbal tea. "Artichoke tea" is produced as a commercial product in the Da Lat region of Vietnam. A herbal tea called Ceai de Anghinare based on artichoke is made in Romania. The flower portion is put into water and consumed as a herbal tea in Mexico. It has a slightly bitter woody taste. Artichoke is the primary flavor of the 33-proof (16.5%-alcohol) Italian liqueur Cynar produced by the Campari Group. It can be served over ice as an aperitif or as a cocktail mixed with orange juice, especially popular in Switzerland. It is also used to make a 'Cin Cyn', a slightly less-bitter version of the Negroni cocktail, by substituting Cynar for Campari. Artichoke leaf extract has been investigated for its potential to lower cholesterol levels for people with hypercholesterolaemia. A 2013 meta-analysis found it to have a modest effect on reducing cholesterol levels, but with results not compelling enough to recommend its use as a treatment for hypercholesterolaemia. More research was recommended. The globe artichoke genome has been sequenced. The genome assembly covers 725 of the 1,084 Mb genome and the sequence codes for about 27,000 genes. Understanding of the genome structure is important to understanding traits of the globe artichoke, and may aid in the identification of economically important genes from related species. Rezazadeh, A., Ghasemnezhad, A., Barani, M., & Telmadarrehei, T. (2012). Effect of Salinity on Phenolic Composition and Antioxidant Activity of Artichoke (Cynara scolymus L.) Leaves. Research Journal of Medicinal Plant, 6(3).